The truth of the bible from an epistemic and metaphysical perspective. How do we know that that the bible is God’s word or is true? This is a statement of epistemology or knowledge. Let’s begin by answering a few questions. What is knowledge and how do we know anything? Knowledge has been most generally defined as a justified true belief JTB (let us ignore Gettier for the time being; especially since there is no theory of knowledge that is free of any problems). We have a belief about something, we have some reasons for the belief, and of course this belief has to be true. We cannot know something that is not true. Most of us are fallibilists which means that we are willing to grant someone knowledge with the possibility that their claims may be wrong. To the fallibilist the only propositions that are certain are necessary propositions that we might find in mathematics and logic e.g. the proposition that (2+2=4) or the proposition (I am 50 years old & it is not the case that I am 50 years old). The first proposition is necessarily true and we could know this with certainty. The second proposition is necessarily false and we could know this with certainty. You might ask how we can be possibly certain? The propositions in question are propositionally certain meaning there are no possible circumstances where the truth values could be anything other than what they are; but the believer’s ability to apprehend the truth of the necessary truthfulness or falsity of these propositions is not certain (epistemic certainty). Most of our knowledge about the world, universe, life in general is experiential and therefore contingently true and lacks this propositional certainty – so we are all fallibilists or we would never grant anyone knowledge. The exception to this is if one's metaphysical presuppositions allow for necessary laws in the universe; such as the laws that govern an electron orbiting a nucleus and other laws the we all act and move upon as though they were certain. But this positions demands a divine law-giver. Could you imagine a world where we didn’t know if the sun would rise tomorrow, or that when a chemist combines two compounds, he couldn't have the confidence to rely on a certain outcome and progress unto new truths; how could science or life ever progress? So, most of us are willing to grant claims about things the status of knowledge so that we may have the confidence to move forward with science and discovery. We actually grant that these laws are necessary but the atheist when cornered will say these laws are probably true with a very high rate of probability. 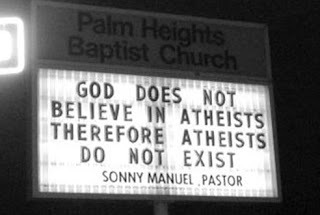 My question to the atheist is how does he calculate the probability of the law of gravity when he has never experienced it failing? Could it be that his science is really an extension of his metaphysical presuppositions? We come to know things in (2) ways: we know them through reason or a priori and through experience or a posteriori. Truths of reason can be known without experience e.g. I don’t need experience to know that (if A is taller than B, and B is taller than C, then A is taller than C). This by the way, is also a necessary truth as well. On the other hand to know the proposition (John Kennedy was president of the United States) would have to be known through experience. I personally may not have seen John Kennedy with my own eyes, but I can take the testimony on the authority of someone who did. This knowledge would ultimately be grounded in experience even though the testimony of the truth of this proposition would be grounded in someone else's experience. In fact almost all of our knowledge of the material universe is a posteriori and known through experience; albeit through the testimony of others. I know that George Washington was the first president of the United States. How do I know this or have a JTB? My justification is grounded in empirical evidence or experience through the testimony of books written by historians, by the testimony of my teachers in grade school, pictures of George Washington…all of these proofs are taken on the authority that someone actually experienced or saw, touched, and talked with George Washington and can vouch for his presidency. So now I have a Justified Belief and most likely True – hence I have knowledge. On a sidebar, all knowledge can be challenged with the trust-worthiness of the eye witnesses and those who have recorded their testimony, their memories and senses can be challenged…knowledge can also be challenged on a logical basis such as issues dealing with circularity, the grounding and definitions of basic beliefs, infinite regresses, and the problem of the criterion by which we assess the instances of knowledge. What I am saying is that it takes faith and acceptance of basic beliefs that are agreed upon before we can make any knowledge claims whatsoever. These issues of faith and "dogmatism" are not limited to religious or spiritual knowledge. Too often we like to compare secular knowledge to religious knowledge, and give the secular knowledge a privileged status; unknowing that the grounding of both secular and religious knowledge are subject to the exact same challenges. Can you prove that you are not dreaming that you are reading this article and that you are sitting at your computer in reality...philosophically you cannot. In fact you couldn't prove to me that your hair is a certain color without begging the question. The only way of escape from solipsism or skepticism is to ground ones knowledge in an analogous fashion with the self-sufficient knower whose knowledge is incorrigible. Now the ultimate question: How do I know the bible is true? The authors of the 66 books of the bible claimed to be under the inspiration of the Holy Spirit, this is no more circular than a defendant in court testifying to his own innocence. These 66 books written by 40 different authors over 1,500 years have high degree of coherency. There exists over 24,000 New Testament manuscripts dating back to the first century that reflect the accuracy of our modern day translations. The next book in antiquity that even comes close to this manuscript evidence is Homer's Illiad - there are about 6,000 copies in existence. The spurious apocryphal writings such as the Gnostic gospels or the Lost Books of Eden or the books mentioned in the De Vincci Code were never in any of the church cannons. Jesus declared Himself to be the Son of God, this was a claim that He is God Almighty. No man other than Jesus, no book other than the bible has had such an impact on the world. Ultimately, the bible is self-authenticating by the witness of the Holy Spirit, grounded in as the revelation of the self sufficient knower whose knowledge is incorrigible. My knowledge is analogous with God's knowledge, not autonomous. Jesus said that if we believe in Him He will give us a new birth and we would never see life the same; and I can testify to that truth along with millions of other believers as well of whom all have been regenerated by the Spirit, and receive the revelation knowledge of the bible and Spirit. I can speak with thousands of believers and hear the same story and share in the same life changing experience of regeneration by the Spirit with little to almost no variance in experience. The bible is the final authority of truth just as God is the ultimate arbiter of what is good and what is evil because He is good. How much more evidence could God have provided us? He came down and appeared to the Jews performing great miracles; He came down as the Son of God, He rose from the dead, even if God were to appear to someone today as He had done in the past; you would most likely have to take this knowledge on the basis of someone elses' testimony. People of this era have absolutely NO excuses for not believing in God and His bible. We have more justification for believing that the bible is true than we do for most knowledge that we consider true; and all of these proofs are empirical. My prayer is that you don't do as the Jews and Greeks did in the earlier centuries and trip over the cornerstone - being Christ and His words that He left behind for us to know Him and obtain eternal life.